Well worth the wait for Thomas Keller's baked goodies from this charming Yountville boulangerie-pâtisserie. 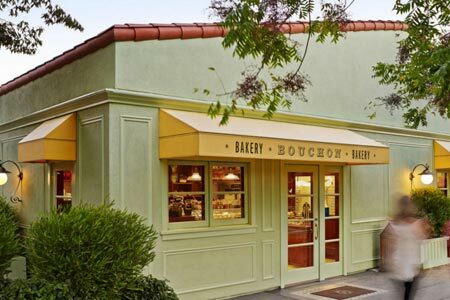 : Join the queue bulging from this boulangerie-pâtisserie adjacent to Bouchon restaurant, a pilgrimage for the bed-and-breakfastless and Thomas Keller groupies. Proudly binge on jelly donuts made from brioche dough, croissants guaranteed to flake from butter built into the strata, and nutter-butters epitomizing pure peanut butter goodness. Tote epi baguettes or dense rye-wheat bread to a picnic, or consider pre-made sandwiches and quiche. A three-word tip: bacon cheddar scones. Take your goodies to go or watch the Yountville scene while dining in the nearby pleasantly shaded courtyard.